Composition (aka. Asphalt) Shingles have been around more than 100 years and are the most common roof covering material used in the United States. In fact, around 75% of residential homes are covered in asphalt shingles in the U.S. Composition Asphalt shingles are cheaper than most other alternative roofing materials and are readily available in a variety of sizes, styles and colors. Although Composition Asphalt Shingles have a shorter lifespan than alternative, more expensive materials, their lower cost makes them attractive. They typically last 20 to 40 years and usually offer a 20, 25, 30, 35 or 40 year factory warranty depending upon the specific product purchased. An asphalt shingle roof can be layered over the top of an existing shingle roof if the initial roof is a single layer and in good condition. An ’overlay’ roof will typically not last as long as a completely new roof. What is a Composite Shingle? There are two types of asphalt shingles that use different base materials: organic felt, and fiberglass. Both types have their base in between two layers of stabilized asphalt. Their top sides are coated with mineral granules to help resist weathering while their bottom sides have a heat activated self seal strip that seals the shingle to the layer below to combat wind damage. These materials can be installed on most roof pitches and types. What are Asphalt Roofing Shingles Made Of? Organic shingles were the first type of asphalt shingle offered but are much less commonly used today. They have a base of organic felt, which is saturated in liquid asphalt. They are more resistant to tearing during installation than fiberglass mat shingles. Unlike fiberglass shingles, organic shingles are more prone to three aging problems that may negatively impact the appearance of your roof. 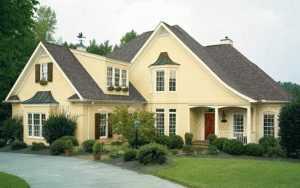 The more commonly used fiberglass based shingles are lighter, more flexible, and cheaper. They are less resistant to tearing than organic felt, so precaution is needed during installation. Once installed, fiberglass mat shingles are just as durable as organic felt shingles. While clawing, curling, and fish mouthing can occur on fiberglass based shingles, it is less likely.